Darksiders II is a hack and slash action-adventure game developed by Vigil Games and published by THQ. 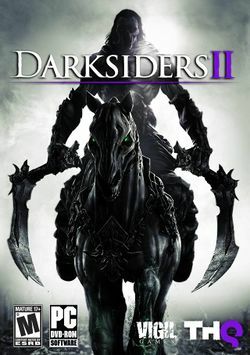 Taking place concurrently with the first Darksiders, the game follows the Horseman of Death as he sets out to clear War's name by reviving humanity. The game was released for the Xbox 360 and PlayStation 3 on August 14, 2012 in North America, on August 16 in Australia, on August 21 in Europe, and November 29 in Japan. It was released on the Wii U on November 18, 2012 in North America and on November 30 in Europe and Australia. Following the dissolution of THQ and Vigil Games, the IP was picked up by Nordic Games, who released an updated version of the game titled Darksiders II: Deathinitive Edition on the PlayStation 4 and Xbox One.